The Sagrada Familia is a famous Catholic church located in Barcelona. It was designed by a Catalan architect, Antoni Gaudi. Sagrada Familia is a huge architectural project with colourful, mathematical design elements, and Gaudi knew it would not be completed within his lifetime. Construction began in 1882 and it is anticipated that completion will actually be around 2026! 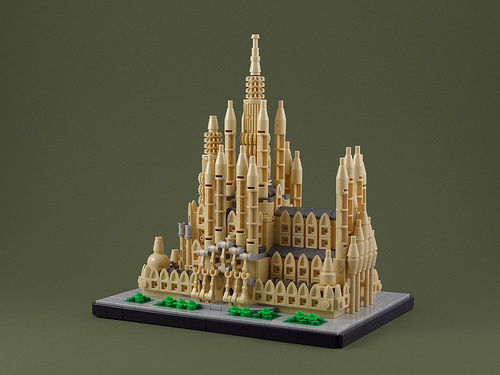 Koen has built a microscale LEGO model of the completed Sagrada Familia that looks like an official LEGO Architecture series model. The use of inverted ice-cream cones is inspired. A view from another angle shows another feature I particularly like, Koen uses the scroll brick as a nice decorative component of the doorway. 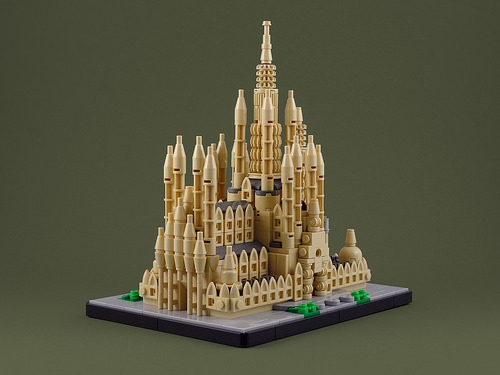 Koen has cleverly managed to balance the simplicity required in microscale with the hugely complex design of this particular structure. Despite my stated fascination with Stalingrad, it does occasionally feel unfortunate that I find myself building what amounts to Stalin’s war machine. I took a break over the weekend to build some military models with slightly less moral ambiguity, inspired by the Republican forces who fought a losing battle against Fascism in the Spanish Civil War. In 1936, Fascist elements within the Spanish military launched a coup d’etat against the democratically elected Second Spanish Republic. Supported by Hitler’s Germany and Mussolini’s Italy, Generalissimo Franco’s “Nationalist” forces quickly gained the upper hand, and Spain soon became a field experiment for the weapons and tactics that would be used shortly afterward in World War II. For example, the German and Italian air forces destroyed the town of Guernica, an atrocity memorialized in the famous painting by Pablo Picasso. 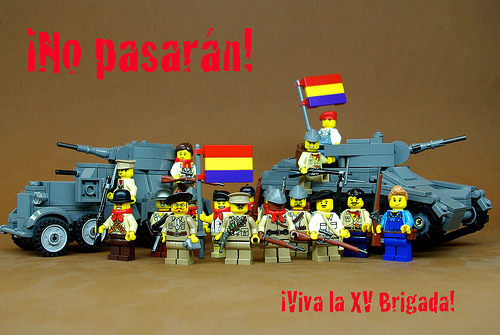 Everyday people from across the world flocked to join the Republican cause, including thousands of American and British volunteers, who formed part of the “International Brigades.” George Orwell fought alongside Republican forces (which inspired Homage to Catalonia), and Ernest Hemingway was embedded with Republican troops as a journalist (which inspired For Whom the Bell Tolls). The base of support for the Second Spanish Republic’s secular, egalitarian platform rested among socialists and trade union members, including many communists (back before communism as an ideology was the exclusive province of authoritarian regimes). 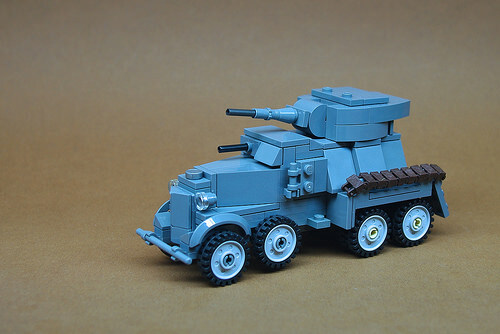 As a result, only Stalin’s USSR rushed to the aid of the Republicans, sending arms and armor such as the Soviet BT-5 tank and BA-6 armored car that I’ve built here from LEGO. My BT-5 is based on my own BT-7, as I mentioned yesterday, but the BA-6 proved a bit of a challenge. The angular hood and rear hull both required some half-stud offset and SNOT (Studs Not on Top) construction, including the two middle axles, built onto the chassis with jumper plates. The turret turns, the gun elevates, and both side doors open. Its plight ignored by all but Mexico and the Soviet Union, the Second Spanish Republic fell to Franco and his Fascist forces in 1939, on the eve of World War II. Franco remained ostensibly neutral during the war, and then became a key NATO ally during the Cold War. He ruled as an authoritarian dictator until his death in 1975. An estimated half a million people died during the Spanish Civil War, and mass executions continued long after the end of the civil war. As I wrote in my post yesterday about Stalingrad, using LEGO to recreate historical people, places, and even equipment connects me to history in a tangible and meaningful way. My hope is that I’ve piqued your interest as well.